How cool is your little Cartesian Diver? It’s amazing that you can make it float or sink with just a little squeeze of the bottle. Sparkling drinks are fizzy because of a gas (carbon dioxide) that’s dissolved in the water. The gas forms little bubbles which rise to the top, where they burst. If you put some raisins in a glass of sparkling water and watch what happens. The tiny little dents and indentations in the side of the raisin give the gas something to form a bubble around. When the raisin has enough bubbles it can float up to the surface. The bubbles then pop, the raisin sinks and the whole merry dance begins again. Try making an artificial raisin out of blu-tac. Remember it’s all the little tiny nooks and crannies that allow the bubbles to form. It’s surprisingly difficult to get it to dance like the raisin, but it is possible, so keep trying! A similar thing happens when you put Mentos sweets in a bottle of Coke. The tiny imperfections on the surface of the Mento acts as sites for bubbles to form. Lots of bubbles. Lots of bubbles. What, you’ve never put Mentos in Coke? Go outside and do it right now! The key to being able to make things float is displacement. When a boat floats it shoves water out of the way – it displaces it. The displaced water weighs as much as the boat. But if the boat’s too heavy for its size it can’t displace enough water to balance out, and it sinks. This means you can build boats out of metal, as long as they’re large enough to displace enough water to offset their weight. You can have a go at boat design using kitchen foil and pennies. Make a boat shape from the foil, and check it floats. Then load it up with pennies. How many could you get in your boat before it sank? Try a redesign, and try again. Remember, you want your boat to take up as much space as possible, so that it displaces a lot of water. Another way to make your boat float is to make the water heavier. When you add salt to water and dissolve it, you are increasing the density of the water – it takes up the same space, but weighs more than it did. This is why it’s easier to float when you’re swimming in the sea than when you’re in a pool, the sea is saltwater. If you’re in the dead sea, which has an unusually high salt content, then you float very easily indeed. You can test this out using a bowl of water and an egg. 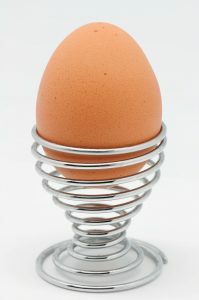 If you put an egg into a glass of tap water, it will sink. However, if you add a lot of salt and dissolve it in the water first, you can get the egg to float – a great trick to bamboozle your friends!